Want faster trains? Difficulty finding seats? Hate the constant delays? We're here to help! Quite a lot actually. Make your voice heard at NJT Board Meetings. Distribute our Railgram newsletter. Get Involved. Join Today! Join Us as the Coalition Celebrates our 40th Anniversary! April will be a big month for the Lackawanna Coalition. We will be celebrating 40 years of service to the train riders in our region and their communities, and we would like you to celebrate with us. 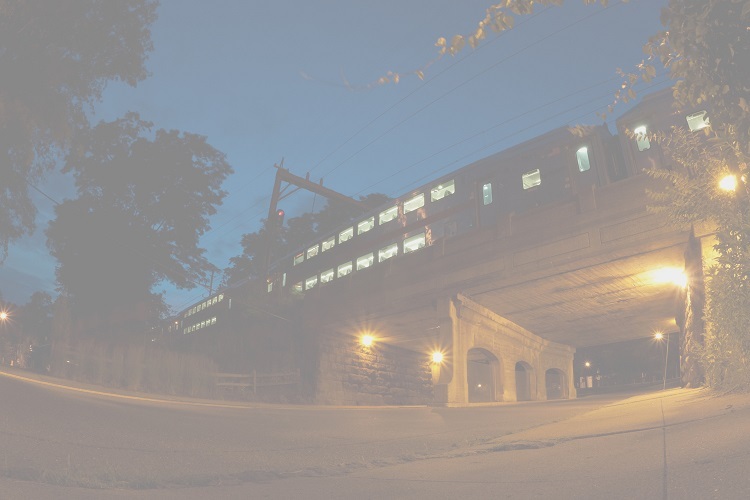 The Coalition began as the Millburn Commuter Watchdog Committee, in response to deteriorating conditions and service on the Morris & Essex Line and other nearby rail lines. Our founders changed the name to the Lackawanna Coalition in honor of the Lackawanna Railroad, our heritage railroad, and to establish a more-regional orientation. At first, we represented riders on the Morris & Essex Line, as well as the Montclair and Gladstone Branches, and their communities. Today our purview has expanded to include the entire Montclair-Boonton Line, and our area of interest comprises all transit that connects with our primary lines of concern. That means North and Central Jersey and New York City, because riders on our primary lines go to all those places. Come and learn more about us, our history and our railroad. Throughout the month of April, we will present a small museum-style display of artifacts from the Coalition, the Lackawanna Railroad and the town. The artifacts come from members' collections, as well as the Millburn-Short Hills Historical Society. The exhibit will be on view at the Millburn Library until the end of the month. To view it, look for the display case to the right after you enter the library. We also invite you to come to our regular meeting on Monday, April 22 at Millburn Town Hall, starting at 6:45 pm. Our meeting will feature a celebration of our special anniversary, with stories and refreshments. We hope you will come and celebrate with us, and we hope that you will join the Lackawanna Coalition and help us advocate for better train service on New Jersey Transit. When we reported to you about the hearings that will give you an opportunity to be heard about the trains that have been removed from the schedule on our lines, we also reported that the event will take place at Morris Township Hall; a venue that is not transit-accessible. We now have good news for you: even if you depend on transit: you can still get there. Morris Township, in cooperation with the Lackawanna Coalition, will offer transportation from Convent Station to Morris Township Hall and back next Monday, March 11, for the event. The town will make two trips with the van, for early and late commuters, with two trips back to Convent Station. Both trips are scheduled to connect with eastbound and westbound trains, so attendees who need a ride will have access from all points on the Morris & Essex Line. The hearing is scheduled to start at 6:00, and the early run will get you there in time for the beginning of the event. 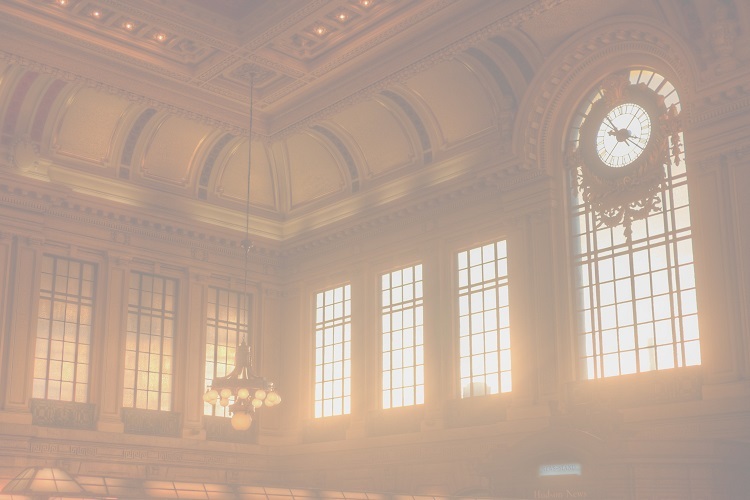 The early run will leave Convent Station at 5:45 pm, connecting with the 4:43 train from Penn Station, New York (which connects with the 4:27 train from Hoboken at Summit) and the 5:15 train from Dover. The late run will leave at 6:50 pm, connecting with the 5:49 train from New York (which connects with the 5:33 train from Hoboken at Summit) and the 6:20 train from Dover. Returning, the early run of the van will leave Town Hall at 7:10, connecting with the 7:24 train to New York and the 7:35 train to Dover. The late run will leave Town Hall at 8:00 and connect with the 8:16 train to Dover and the 8:19 train to Penn Station, New York. For connections to Hoboken and other stops, please consult the Morris & Essex Line timetable or check on NJ Transit's web site, www.njtransit.com. We thank Township Administrator Timothy Quinn, Council Member Catherine Wilson and the town's representative on the Lackawanna Coalition, Robert Drucker. This is a great example of how a town can use its resources to help people who need that assistance. We hope that this will be the first of many examples of such cooperation between our towns and the advocates for our transit riders. New Jersey Transit has announced that trains between Philadelphia and Atlantic City on the Atlantic City Rail Line and the Dinky, a shuttle between Princeton Junction and a point near downtown Princeton, will start running again on Friday, May 24, just before Memorial Day week-end. The lines were completely shut down last year after Labor Day, and riders have been taking buses provided by NJ Transit as substitute transportation since that time. Kevin Corbett, Executive Director of NJ Transit, made the announcement at a hearing in Cherry Hill, called for the purpose of allowing riders to voice their concerns over the lack of rail service. The Philadelphia Inquirer and its web site, www.philly.com, reported that nobody applauded when the announcement was made. Riders in our region were not so lucky. There has not been any announcement of when riders in North or Central Jersey, north of Princeton, will again be able to ride any of the trains from the lines in our region that were also eliminated. NJ Transit originally said that all trains would be restored by the beginning of this year, but that date has been pushed back three times. The latest word is that all trains will be restored during the "second quarter" of this year. There will only be 37 days left in the quarter after the Dinky and Atlantic City trains return to the rails, so the Coalition and many riders in this region are concerned that the trains we lost last year will not come back by the end of June, if they ever do. Since last year, there have been no week-end trains on the Gladstone Branch west of Summit, but substitute bus service has been available. There are no direct "one-seat-ride" trains to and from Penn Station, New York on the Raritan Line. Selected trains on the Morris & Essex (M&E), Montclair-Boonton and other lines have been removed from the schedule, too, but those service reductions have only left gaps between the trains that still operate. There were no schedule adjustments to smooth out those gaps, and no substitute buses, except for one train that has been suspended. That is Train #684, the former 11:30 pm train from Dover; the last inbound train on weeknights. Because of our advocacy efforts, NJ Transit has hired the Lakeland Bus Company to run a bus on the former train's schedule to all Morris County stops and to Summit, where a connection to Newark and Hoboken is available. This prevents riders from being stranded. 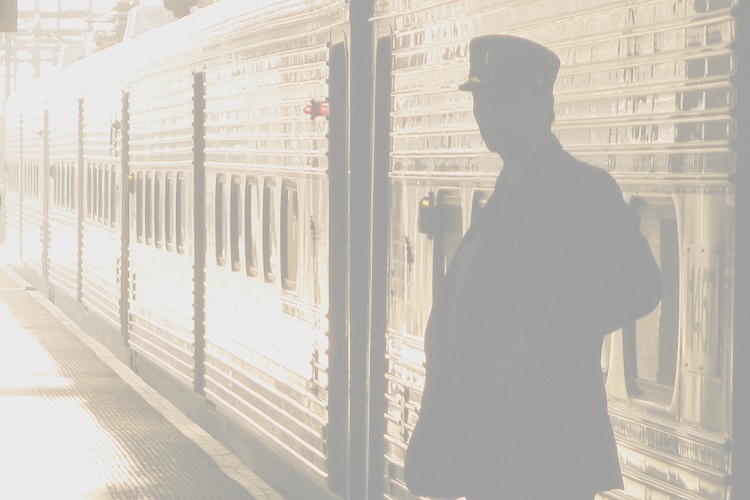 These service cuts were purportedly implemented to facilitate the installation of Positive Train Control (PTC), a safety system mandated by Congress and the Federal Railroad Administration (FRA). At the beginning of last year, NJ Transit was behind schedule in installing the needed equipment and training employees how to use it. By the end of 2018, the agency had met the FRA's target for the year. Management has received high marks for getting that part of the project completed on time. NJT proposed a plan to complete the job by the statutory deadline of the end of 2020, and the FRA has approved the plan. At this writing, nobody knows when, if ever, the trains that used to serve this region, but have been removed from the schedule, will come back, if they ever do. NJ Transit is not talking about it, and neither is Gov. Murphy. Advocates in South Jersey credited local politicians with putting the pressure on Murphy and NJ Transit to restore Atlantic City service by Memorial Day, and it appears that the trains will be back by then. Summer is the busy season at the Shore, and it only lasts about 14 weeks; from Memorial Day to Labor Day, with some businesses staying open on week-ends in September. The Shore needs all the transit it can get during the "season" but this region needs its transit, too. When we will get our trains back is anybody's guess. As he begins his third term in office, New York Governor Andrew M. Cuomo brought sighs of relief to residents and business owners on and near Fourteenth Street in Manhattan, as well as in the now-trendy neighborhoods of Greenpoint and Williamsburg in Brooklyn. Residents in these areas had dreaded a 15-month shutdown of the "L" subway line in their areas that was scheduled to begin in April, but Cuomo has announced that service will continue. Not only with this change benefit the City's subway riders, but it could also benefit the Lackawanna Coalition and other advocates who are pushing for a more-affordable alternative to the costly Gateway proposal for new new rail infrastructure between New Jersey and New York City. The "L" line runs under Fourteenth Street, through the Canarsie Tunnels into Brooklyn, and eastward through that borough, to Rockaway Parkway, near Canarsie Shore (it ran all the way there many years ago). The Canarsie Tunnels were damaged by flooding from Hurricane Sandy in 2012, and must be repaired. Plans by the Metropolitan Transportation Authority's MTA Capital Construction arm approved in April, 2017, called for shutting down the portion of the line under Fourteenth Street and in Greenpoint, Brooklyn for fifteen months, and at a cost of $492 million. The plan called for major transit disruptions in the affected areas and "replaced" by augmented service on the "G" train (Brooklyn-Queens Local), which connects with the "L" but does not enter Manhattan, and extra buses on Fourteenth Street. Neither of these services would have crossed the East River to link the boroughs. During the shutdown, the bench walls inside the tunnels, which contain power and signal cables, would have been demolished and replaced with new bench walls and cables for the tunnels' entire length. Cuomo called in experts from the engineering faculties at Columbia and Cornell Universities, who studied "best practices" for tunnel construction in cities outside this country, including London, Hong Kong and Riyadh. Rather than demolishing and rebuilding the bench walls with new cables inside, the engineers recommended abandoning the cables inside the bench walls, "racking" new cables (essentially securing them to the inside walls of the tunnels), keeping the existing bench walls as walkways where they are structurally-sound, replacing the segments that are not with new walkway surface, and using modern materials to improve strength and waterproofing. The new plan, as proposed by the Columbia and Cornell engineers, should save a considerable amount of money, although we do not yet know how much. It cost $71.6 million to rehabilitate the Clark Street Tunnels between Lower Manhattan and Brooklyn (used by the #2 and #3 trains). It may be even more important to residents and business owners along the line that the scope of the project will be reduced sufficiently to allow construction at night and on week-ends, with reduced service during those times, because one tunnel must be shut down for construction. There would be no loss of service during peak-commuting hours, which would avert a major and long-term service disruption. At this writing, not everybody seems to know what to make of the news that the long shutdown has been averted. Coalition member John Bobsin reported on the Coalition's web forum: "Cuomo bypassed his MTA and consulted academic experts, who suggested techniques involving sonar never before used in U.S. Nobody seems to know what this means yet, but all sorts of advocates are being quoted. One called it a last minute Hail Mary pass; another said even doing the work nights and weekends posed a great burden on the public. The effect on Brooklyn real estate prices was also being pondered." One of those advocates, Coalition member Joseph M. Clift, also a former Planning Director for the Long Island Rail Road (LIRR), was ecstatic. He said: "It makes sense instead of dollars." He was referring to dollars that will be saved, now that it will not be necessary to demolish and rebuild the bench walls, or to take the entire line out of service for an extended period. Clift continued: "Who would be able to give you the most cost-effective advice: engineering deans and their specialists, or industry insiders? The answer should be obvious." A presentation from the governor's office, which can be found here, explains the new plan. One statement from that presentation may have a large impact on the proposed Gateway project and the Coalition's advocacy for a reduced scale plan that would be significantly less-expensive than the $30 billion estimated cost for all of Gateway as currently proposed. It is noted under "Benefits" and says: "This new system design approach can be potentially applied to other projects, such as the Second Ave. Phase 2 and Hudson River Train Tunnels." The former refers to the Second Avenue Subway, while the latter refers to the tunnels on Amtrak's Northeast Corridor (between New Jersey and Penn Station, New York), also known as the North River Tunnels. These tunnels were also damaged by flooding from Hurricane Sandy, and Amtrak says they must be taken out of service for repairs within the next fifteen years. The Coalition has been spearheading the effort to get a more-affordable alternative, with a cost sufficiently low that that the federal government would be willing to pick up some of the tab. Long-time engineer and planner George Haikalis who is President of the Institute for Rational Urban Mobility (IRUM) as well as Chair of the Village Crosstown Trolley Coalition and the Regional Rail Working Group, praised the new plan, saying: "At last, a sensible discussion of L Train tunnel repair strategies. The same is needed for Hudson Tunnel repairs." Clift agreed and said: "They got an honest second opinion -- one that is not encumbered by the fear of not getting future work from a major player like the MTA." Whatever effect Cuomo's about-face on Canarsie may have on Gateway or advocacy for a more-affordable alternative to it remains to be seen. What we already know is that Cuomo started his third term with a bang. The new plan should improve transit service by averting a major disruption, while saving money; a rare feat in today's political arena. New York City's transit riders will certainly notice, and many of the state's voters will probably notice, too. We are not a political organization, but it is impossible to observe transit without observing politics, too. Cuomo has been mentioned as a possible contender for the Democratic Party's presidential nomination next year. Massachusetts Senator Elizabeth Warren has officially started her campaign already. If Cuomo has unofficially kicked off his own campaign, he chose an interesting way to do it. Of course, Cuomo has already been governor for the past eight years so, at least in theory, he could have done this sooner. Still, the timing of his action might be good for all concerned. Time will tell, and it will be an interesting ride. The Lackawanna Coalition has voted "no confidence" in the leadership of Richard Anderson, President of Amtrak. 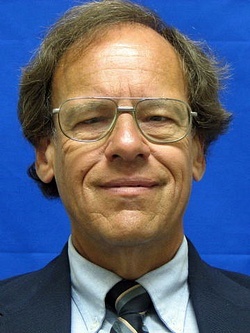 Anderson, who spent much of his career in the airline industry, came to Amtrak at the beginning of 2018, and has drawn strong criticism for eliminating food and other amenities on certain trains, eliminating or reducing discounts for such traditionally-rail-friendly groups as students and seniors, and attempting to kill long-distance trains, particularly the Southwest Chief between Chicago and Los Angeles. The letter sent by the Coalition along with the resolution stated: "New Jersey and the riders on New Jersey Transit's trains have strong reason to be deeply concerned about the future of Amtrak. Most of the riders on the portion of Amtrak's Northeast Corridor line (NEC) through our state and into Penn Station, New York, use New Jersey Transit's trains; many more riders than use Amtrak's trains over the same stretch of track. This applies to commuters, regular riders, and occasional riders alike." While the Coalition's purview is regional and not national, our letter expressed concern that Anderson's plans to shrink the national rail network could have negative consequences for us in New Jersey, saying: "We are especially concerned that, if Anderson succeeds in shrinking the Amtrak network, the result will be a loss of Congressional support for Amtrak, especially among members whose constituents stand to lose their Amtrak train. This scenario would have a detrimental effect on funding for projects that are vital to our region, including new tunnels into Penn Station and necessary 'state of good repair' projects." Preserving the national Amtrak network may take on even stronger significance for us when the new Congress convenes. Democrats, who will control the House, are generally more favorable to Amtrak and to local transit than Republicans. Republicans have expanded their majority in the Senate, and they (like Democrats) are sensitive to the possibility of their constituents losing Amtrak service in their state. If Amtrak kills a train in their state, they could vote against money for Amtrak, which could adversely affect Amtrak projects in our region. The Coalition is not the only rider-advocacy organization that has declared its opposition to Anderson. The New Jersey Association of Railroad Passengers (NJ-ARP) has urged the Amtrak Board of Directors to fire and replace Anderson. Nationally, the Rail Users' Network (RUN) has also passed a "no confidence" resolution against Anderson. It can be found on the RUN web site, www.railusers.net. One of the options on the site is "About/Join" and it will have a further option of "Testimony & Statements." The cover letter and Bill of Particulars complaining about Anderson and his policies can be found there. This writer, who is also a member of the RUN Board of Directors, drafted the original Bill of Particulars, which the Board modified and approved. It began as follows: "Since becoming President of the National Railroad Passenger Corp. (Amtrak), Richard Anderson has made decisions and implemented policies to the detriment of the Corporation and its customers. These acts have threatened to destroy the existing Amtrak network, alienated constituencies whose support is vital to Amtrak, and severely reduced the sort of amenities and services that have attracted the public to rail travel." RUN went on to criticize him for threatening to destroy its national passenger-rail network, eliminating services and amenities, alienating rail-friendly constituencies and jeopardizing state-supported trains, among other allegations. Both RUN and the Coalition called for Congressional action. The Coalition sent its letter and resolution to New Jersey's Congressional delegation. RUN called for the House Transportation Committee to hold hearings about Anderson. RUN's request was: "Because of the many detrimental actions, in-actions and recommendations which are stated above as well as the other items listed in the attached Bill of Particulars, we respectfully request that Mr. Anderson’s competency be evaluated by the House Transportation Committee before the national rail passenger system further deteriorates and current ridership as well as future growth is destroyed." With action by the Coalition and NJ-ARP, New Jersey advocates have taken the lead in calling for new leadership at Amtrak. Advocates here and elsewhere in the nation want improvements in Amtrak management that will keep the trains running and improve the customer experience. It's not only for Amtrak's customers; projects along Amtrak's Northeast Corridor (NEC), like new tunnels into Penn Station, may depend on improved leadership at Amtrak, too. Railway Age, a leading trade journal in the railroad industry, has published an OpEd letter by this writer, along with an approving response by Editor-in-Chief William C. Vantuono. We are reproducing this writer's and Mr. Vantuono's comments as they were published in October, in Railway Age. We thank Mr. Vantuono for permission to run this content from his magazine, and we especially appreciate his concern about the current situation at NJ Transit. We will continue to do everything we can to improve our transit and our transit riders' experiences. The more we and our efforts are noticed, the more we can help the riders, who are our constituents. Railway Age was first published in 1856. The link to the story on their web site is https://www.railwayage.com/passenger/commuterregional/if-youre-not-at-the-table-youre-on-the-menu/. 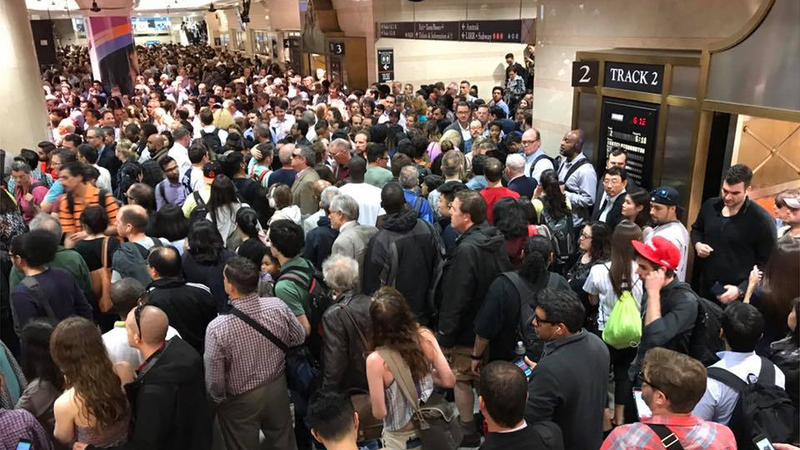 This situation in NJ Transit’s East End Concourse at Penn Station New York has become all-to-familiar to many of the agency’s customers. Editor’s Note: Following is an edited response to my editorial of Aug. 10, 2018, on a New Jersey Transit board meeting. See below for further clarification. I noticed William Vantuono’s criticism in Railway Age of me and my advocacy on behalf of New Jersey Transit’s beleaguered rail riders, [and] am proud to have finally earned his attention. Mr. Vantuono criticized me for my passion on behalf of myself, the organization of which I have been chair (Lackawanna Coalition) for almost 19 years, and our constituents who must live with the mobility that the motorists who run NJ Transit dole out to them, going on with their lives in a spirit of nobility and occasional indignation. Mr. Vantuono cautioned me to “calm down”; yet … it [is] only this level of passion, fueled by the realization that we never know whether a train will actually appear at the station or not, that jolted him into noticing the reality with which we who depend on transit are compelled to live. When Mr. Vantuono said that our transit got worse under the Christie Administration, he is correct. But why did he refrain from using the power of his forum at Railway Age to complain about the plight of the Garden State’s rail riders at the time? If things were as bad as he says (and I certainly believe they were), he let the riding public down by remaining silent. I said that our transit has not improved under the [New Jersey Gov. Phil] Murphy Administration; that it has actually become worse, and I stand by that. I depend on transit, and I ride frequently. So I know. I hope that situation will improve, but there will be no improvement as long as the “powers that be” … ridicule and criticize the efforts of civic advocates like me, who dare to speak up in defense of New Jersey’s forgotten riders, who do not even know whether or not they will arrive at their offices on time, or whether they will be able to follow through on their plans for the day, because they can’t be sure that their train will arrive to pick them up. It would have been much better if my “calm” and less-impassioned delivery in the past had gotten Mr. Vantuono’s attention, along with that of other members of the media. Sadly, it has not. My constituents and I were regularly ignored. When our transit had gotten so bad that I felt no choice but to make my statement in the manner I used, I received more coverage from the media generally than ever before in my 33 years as an advocate for the riding public. I even got his attention, which has never happened before. So, whatever badge Mr. Vantuono wishes to pin on me, I will wear it proudly, in the service of my fellow transit riders, who deserve better transit. I am delighted so see that Mr. Vantuono finally cares. That took too many years. Yes, the policies of the Christie Administration were usually bad for transit riders. So are the policies of the Murphy Administration, which has not made the needed changes and also chooses not to listen to us. The legislature is not much help, either, but I will continue to do everything I can to secure better transit for myself and my constituents. As Mr. Vantuono advises, I can calm down. I am prepared to engage in calm, rational discussions and negotiation with management, on behalf of the riders, with the Board and management who decide how much transit we may have, and when we may have it. However, that requires a “seat at the table” which we certainly do not have now, and never had in the past. There is an old saying: “If you’re not at the table, you’re on the menu.” We, the riders of New Jersey Transit, are sick and tired of being on the menu. Thank you for finally noticing that we exist, Mr. Vantuono. This is, indeed, a step in the right direction. Late-evening inbound riders from Morris County stations on the Morris & Essex (M&E) Line have lost their last train from Dover for awhile, but they have not lost their mobility. Thanks to the efforts of the Lackawanna Coalition and the cooperation of NJ Transit managers, these riders will not be stranded. Train #684, the 11:30 pm departure from Dover for Hoboken, along with a number of other trains, was eliminated from the schedule starting Monday, October 15th. The same train was also eliminated in 2015, and the Lackawanna Coalition fought to have it returned to the schedule. Currently, the last inbound train leaves Dover at 10:29; the earliest in living memory. To avoid having late-evening Morris County riders stranded, we asked NJ Transit to run a bus from Dover and other stations in the county to Summit, where they could catch the last train toward Newark and Hoboken. On Monday, October 15th, the first weekday without the late train from Dover, we received word from NJ Transit that a Lakeland bus will leave Dover at 11:30 on weeknights, stop at all stations previously on the schedule of Train #684, and drop riders at Summit. There they can catch Train #442, the last train from Gladstone to Hoboken, which is scheduled to leave Summit at 12:37. Train #442 makes all stops. The entire trip will take about 30 minutes longer than it took on Train #684, but there is an indoor waiting room at Summit, and NJ Transit assures us that the trains which have been eliminated from the schedule will return in January, after Positive Train Control (PTC) is installed. Until then, the riders who must do without Train #684 will not be stranded. Week-end schedules are not affected by this change. We thank Paul Wyckoff, NJ Transit’s Chief of Government and External Affairs, and Mike Kilcoyne, VP for Bus Operations, for their prompt response to our request and for implementing a solution that will prevent our constituents from being stranded until the next morning. This is a victory for the Lackawanna Coalition and our constituents, as well as a good example of a positive result achived through cooperation between the Coalition and NJ Transit management. New Jersey Transit (NJT) has announced that more trains will be eliminated, so the agency can continue to install needed equipment for Positive Train Control (PTC). As the year-end deadline approaches, NJT must accelerate its program to install the equipment in locomotives and cab cars, and on the lines. The Morris & Essex (M&E) and Gladstone Lines are the most severely-affected, with eight weekday trains eliminated. These include the last train of the evening from Dover to Hoboken, which currently leaves at 11:30. We are concerned about this train, because it is the last train of the night, and because we previously fought to have it restored to the schedule after it had been eliminated in 2015. The last departure from Dover will be at 10:29 after the new schedules take effect on October 14th; the earliest in memory. There will be no Gladstone trains on the week-ends; there will be substitute bus service west of Summit, instead. The Coalition was pleasantly surprised when Gladstone trains ran this past summer, but the service outage will occur during the fall and winter, instead. Similarly, the "Dinky" train in Princeton will not run on week-ends; buses will also substitute for those trains. The first train from Hoboken to Montclair State Station will also be a casualty. It currently leaves at 6:11, but the first train will not leave until 6:42 under the new schedule. There are also cuts on the Main/Bergen, North Jersey Coast and Northeast Corridor (NEC) lines, but they will not be as severe as the service reductions on the M&E and Gladstone lines. The Pascack Valley and Raritan Valley Lines are not affected, but Raritan Valley "one-seat ride" service to New York was eliminated after Labor Day. So was all service on the Atlantic City Rail Line. NJT management says that these cuts are temporary, and we consider that a promise. We know that the cuts will constitute a hardship for some of our constituents, and will be inconvenient for many more. We know that the deadline for installing PTC is a strict one, but we believe it would have been better if management had worked with us about revising the schedules on our lines, rather than pulling several trains from the schedule, especially the last inbound train of the night from Dover and the first train of the morning to Montclair. There are other trains that will not be removed from the schedule, but whose times will be changed. In some cases, the changes will be significant. We suggest that you check the new schedules when they appear. At this writing, they have not been posted on NJT's web site, www.njtransit.com, nor are they available in "hard copy" form. We will continue to monitor the situation. We remain concerned that more trains will be eliminated before the year is over, and that the pattern of annulling trains (cancelling them before they leave their point of origin) will continue. We also want to be sure that every train that we have lost is restored to the schedule as soon as possible. Our version of a "Coffee Hour" is coming soon to selected stations on the Morris & Essex Line, but instead of taking up an hour of your time, we will accommodate your commuting schedule. As part of our outreach program, we will be holding "Coffee and Commuting" sessions on two successive Tuesday mornings: September 25th in Short Hills and October 2d in South Orange. Through the courtesy of the towns, we will be present at the station those mornings to meet you while you are on the way to catch your train. So, whether you are a commuter or an occasional rider catching an early train, stop by and meet us. Let us know your concerns about our rail service, so we can pass them along to NJ Transit and to appropriate elected officials. We would like to tell you more about us, too, and about what we are doing to advocate for you and your communities. We invite you to have a cup of coffee with us (genuine Brazilian coffee imported from the Ironbound in Newark), grab a copy of our newsletter the Railgram, and let us know how we can help you. We plan to start about 6:30 and stay at least until we run out of coffee. So don't miss "Coffee and Commuting" with us. It's coming soon! 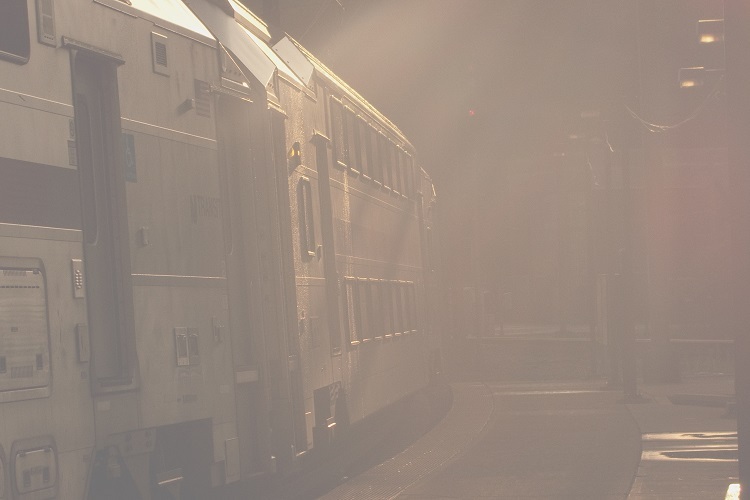 On Thursday, August 16th, the Senate and Assembly Transportation Committees held a hearing concerning New Jersey Transit and the difficulties that its riders currently face. NJT Executive Director Keven S. Corbett and Transportation Commissioner Diane Guiterrez-Scachetti, whose job also includes the post of Chair of the NJ Transit Board of Directors, were the primary presenters. Legislators spent more than two hours questioning them, but allowed them to leave before representatives from labor and from the advocacy community, including me, were scheduled to make our statements. This is the statement that I filed as part of the record of the hearing, on behalf of the Coalition. It was originally submitted with a number of documents as Exhibits, which are now reproduced here. I am David Peter Alan. I live and practice law in South Orange. I appear today as Chair of the Lackawanna Coalition, which began on the Morris & Essex Line and advocates for better service on NJ Transit on behalf of the riders and their communities, and has done so since 1979. I have been riding on the Morris & Essex rail line and other local transit since long before then, and I can tell you that in my experience, our transit has never been less reliable. For the first time, we never know whether or not a particular train will run, because so many of them are annulled or canceled, often without any advance notice. For commuters, this means waiting for an overcrowded train to the office, getting there late, and risking the consequences on the job that result from arriving late. For those of us who depend on transit for all of our mobility, the damage is much worse. On week-ends, these annulments have forced us to endure gaps of two, three or even four hours between trains; long enough to frustrate our plans for the entire day. This interferes with our lives to a degree that is absolutely intolerable. The Murphy administration, including incumbent management, has blamed the former Christie administration and its anti-transit policies for the difficulties that its riders face. I do not dispute that, but the Murphy administration has been in office for seven months and has continued or exacerbated the failed Christie policies in the areas of employee relations, capital projects management, rail service planning and customer communications. Even before Gov. Murphy took office, his transition chief ordered the forced resignations of some NJ Transit managers and secretaries; an order that was never rescinded. Employee morale plummeted. Executive Director Kevin Corbett blamed the current engineer shortage on engineers “playing hooky”; an assertion that certainly does not help the agency attract dedicated employees. The requirement for Positive Train Control (PTC) first came from Congress ten years ago. Even with a strict deadline coming at the end of this year, incumbent management has been so slow to install the new system that they are cutting service to make equipment available. That is why they are eliminating the Atlantic City Rail Line and cutting service on the Raritan Valley Line after Labor Day without public hearings; a move that we believe violates N.J.S.A. §27:25-8(d), which does not distinguish between temporary and permanent service eliminations in requiring notice and hearings. Management missed an opportunity to alleviate the situation this summer, when they could have consolidated peak-period trains because ridership is lighter in the summer, thereby accommodating commuters on fewer trains while making more equipment available for conversion. This would have reduced the number of engineers needed, which would have substantially reduced or eliminated the current rash of train annulments. The opportunity they missed could cost riders dearly this fall. Management has also kept their customers in the dark until trains are almost due at the station; hours after they are actually annulled. This disrupts our lives, whether we commute or, especially, if we depend on transit. We saw advance notice of a few annulments earlier this week, but much more improvement is needed. This management has demonstrated a disrespect for its riders, its employees, and the law. In addition to the issues I have mentioned, they placed two major items onto Board agendas without giving us notice or the opportunity to be heard, in violation of the Open Public Meetings Act, N.J.S.A. §10:4-9(a). At the Board meeting last Wednesday, my colleague, Joe Clift, asked which Board members came on transit. None raised their hands. I asked the same questions ten years ago, with the same result. Our under-performing transit is not a partisan issue. NJ Transit's problems are systemic, and the fault lies with both parties, including the current administration, and you legislators. The NJ Transit Board was and still is a rubber stamp, which went for more than twelve years, including most of the Christie administration, agreeing unanimously with management on every issue. In 38 years, the Board only voted against management twice, in 1995 and 1996. If this is proper governance, I can't imagine what is not. We riders do not have a single seat on that Board. My own Assemblyman, John McKeon asked me for language for non-political appointment of rider-representatives. I submitted it to him, and I never heard from him again. Neither of the current bills, A-1241 or S-630, do anything to reform NJ Transit; they only add more political patronage to an ineffective Board. They will do nothing to advance the cause of better transit for the riders, so we oppose them. If you are willing to change those bills and allow us to have genuine representatives, including persons like me who depend on transit for all of our mobility, it would be a huge step in the right direction. As an example, I have submitted my own credentials. I understand that there are two seats open, and Gov. Murphy can appoint two transit-dependent rider-representatives now, if he so chooses. A transit board with no riders, and especially no transit-dependent persons, makes as much sense as a highway Board without a single motorist. We can't say much about specific solutions to NJ Transit's current woes, because we are not told enough to assist in making decisions about solving them. That would require seats at the table, which you continue to deny us in the new proposed legislation. If you're not at the table, you're on the menu, and we transit riders are sick and tired of being on the menu. As part of our continuing effort to keep you informed about events that concern our rail service and transit generally, we will post our statements from time to time, along with other documents that we believe you should see. We received significant media coverage after I made a statement at the meeting of the NJ Transit Board on August 8th. Here is the statement as I submitted it for the record. Since that meeting, riders on the Atlantic City Rail Line and their advocates have kept up the pressure on NJ Transit to announce a definite date for the return of the trains to their line. In response, at a public meeting held in Atlantic City on August 20th, NJT Executive Director Kevin Corbett said that the line would be back in service by January 1, 2019. We look forward to the trains coming back, and we hope it happens by then. At this writing, there is no similar "date certain" for the return of one-seat-ride service to and from Penn Station, New York on the Raritan Valley Line. We call for the restoration and expansion of that service as quickly as possible. The changes in our right to address this Board, which begin today, include a significant reduction in the amount of time available to us. Instead of the two five-minute opportunities to comment that we had before, we are now allowed only a single five-minute statement. We could say that for giving up this opportunity to be heard, we will no longer be forced to wait through the entire executive session; a feature that discouraged the sort of expression that the First Amendment to the U.S. Constitution is designed to protect. The current start time has shortened our wait by sixty minutes, which is a step in the right direction. We must insist on another change, which is an assurance from you, Commissioner, that if an executive session is still ongoing at 10:00, it will recess until the public portion of the meeting is concluded, so we will no longer suffer the inconvenience of being forced to wait through an entire executive session before we are permitted to exercise our right to speak. Concerning today's agenda, I addressed the budget issues last month. I have submitted a copy of my statement as an exhibit, and I incorporate those remarks by reference as part of today's record. There are other issues that must be dealt with immediately. I have been riding the Morris & Essex Line and other lines now operated by NJ Transit for more than sixty years and have advocated for your riders for more than 33 years, and our transit has never been worse. I have been informed that the entire Morris & Essex Line schedule ran last Saturday. That used to be commonplace. Now it is rare. There have been so many annulments lately that we can no longer count on the transit specified in the schedules, which we consider the contract between NJ Transit and us, the riders. I said that to Paul Mulshine in my personal capacity, and I stand by it factually today. This epidemic of annulments inconveniences commuters, who might not get to their jobs on time and must endure overcrowded trains. For those of us who depend on transit, the situation is even worse. On week-ends, we have been forced to endure gaps between trains of two, three, and even four hours. You motorists who decide how much mobility we are permitted to have are not affected by any of this. But when you reduce the amount of mobility that you dole out to us who depend on transit, as if we are welfare recipients whose benefits you can reduce at will, you interfere with our lives. This is absolutely unacceptable. The impending suspensions of of the Atlantic City Rail Line and the New York trains on the Raritan Valley Line are very troubling, because those discontinuances may be unlawful, and because we do not see how this level of inconvenience to your riders will be very helpful in alleviating the shortage of engineers. Advocates from South Jersey helped get Atlantic City rail service restored in 1990. Now you plan to eliminate all of it without a hearing, which might violate N.J.S.A. §27:25-8(d), a provision that does not distinguish between temporary and permanent elimination. Through a campaign that we support, the Raritan Valley Rail Coalition has fought for years to get direct service to New York, and you now plan to eliminate it, also without a hearing. This leads to the conclusion that, if advocates pushed for a service enhancement, it will forever be vulnerable. We do not see how this inconvenience to the affected riders will help alleviate the engineer shortage, either. Cutting back all Raritan trains to Newark might free up one engineer at a time. Killing Atlantic City service can only make as many engineers available as are qualified to operate on the Newark or Hoboken Divisions, which are a long distance from South Jersey. We don't know how many there are. In other words, the affected riders could be forced to pay very dearly for only a small benefit. We strongly urge you not to eliminate these services. We are also deeply concerned that nobody of appropriate authority at NJ Transit has specified a date certain on which you expect full service on the affected lines to be restored, if you do eliminate them. If these cuts are truly for a limited time only, you can tell us exactly when those services will come back. We remember the express train from Hoboken to Gladstone that was eliminated in 2001, purportedly temporarily to accommodate track work in the Bergen Hill Tunnels. That train never came back, as Amtrak service between New Orleans and Jacksonville was “suspended” for Hurricane Katrina in 2005 and never came back, either. We are concerned that we will lose those trains permanently, and we are also concerned that we cannot count on any particular scheduled train actually running. We want to work with you on solving this mobility crisis, but that is possible only if you are forthright with us, your riders, when you think of cutting our transit.